The train through the Canadian Rockies passes maybe 200m from the campsite at Lake Lucerne, and about 10 trains went through overnight. In the still of the night it felt like those trains jumped right off the tracks and were coming for us. By 7.30 am we were on the road again, looking for bears but instead Grieg got a flat tyre. 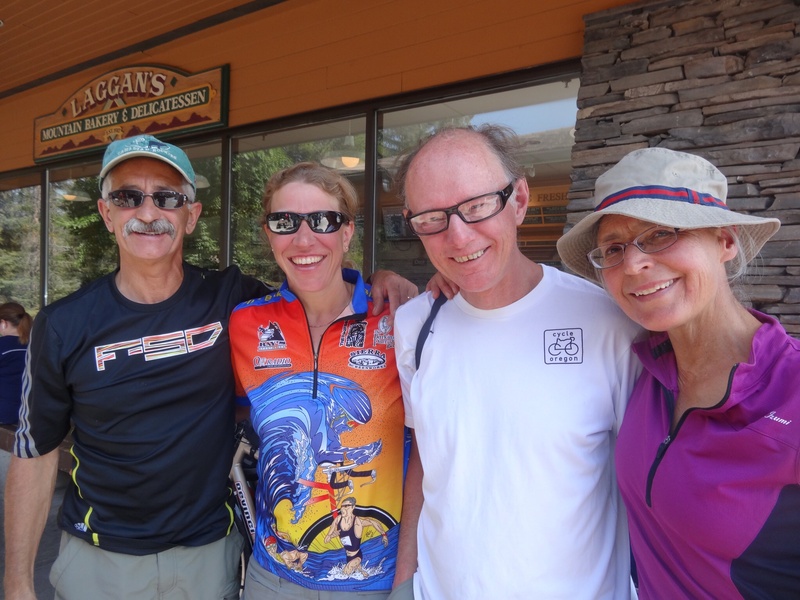 He fixed it in a flash and we arrived at the Jasper info centre by mid morning where we spotted a familiar bike… we were delighted to see Bart again and had coffee with him before he began the trip down Icefields Parkway to Lake Louise. 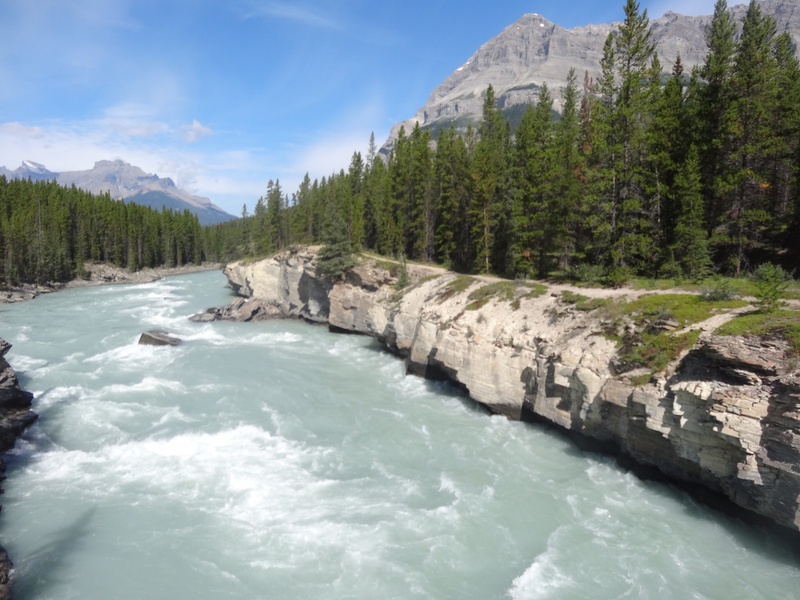 Our plan was to spend two days in Jasper and have a look around this very pretty but very commercial/expensive area….think $5.27 for a coffee! We set up camp in a great spot, once again surrounded by fresh forest smells, darting, chirping squirrels and a roaring fire. 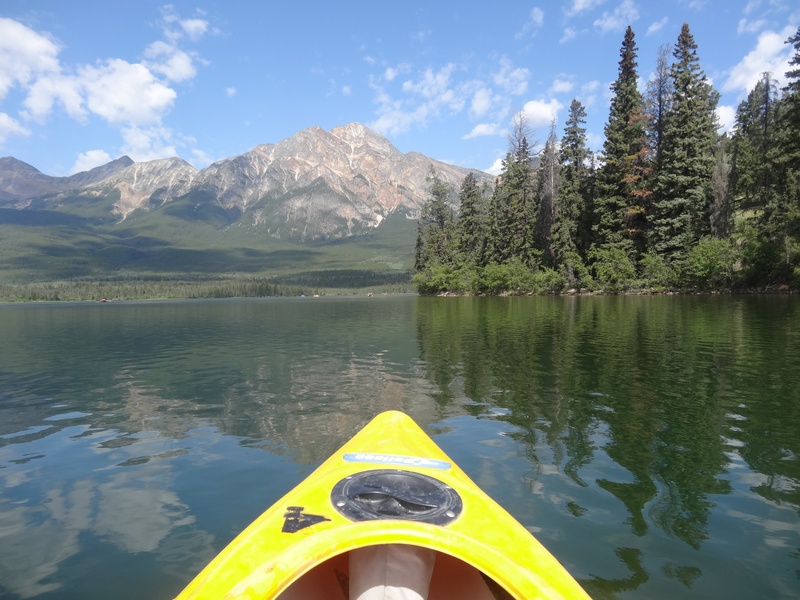 We took the bikes out on some of the many bikes trails and stopped to paddle a kayak around Pyramid Lake surrounded by gigantic mountains in every direction. We also needed to stock up on supplies for the days ahead on Icefields Parkway (or Promenade des Glaciers – I love that!) services are very limited and internet connection non existent. 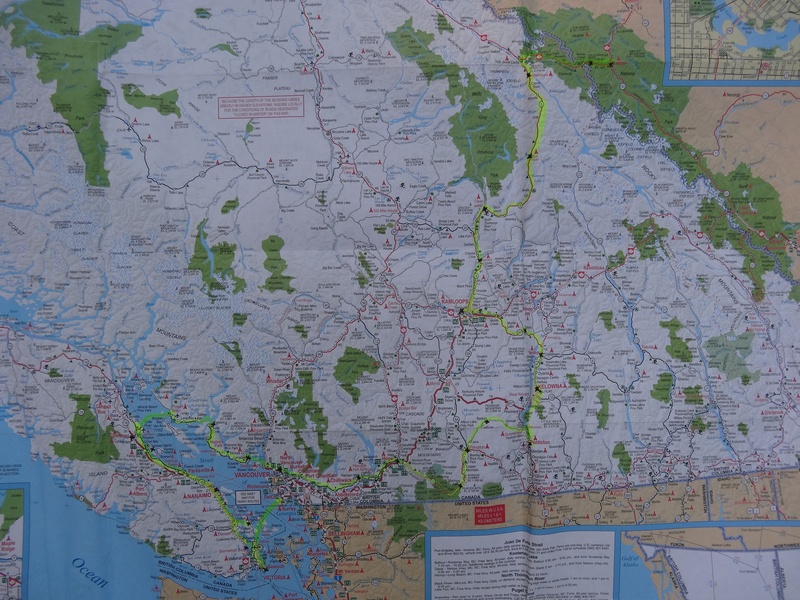 Lengthy discussions were held as to whether we should carry bear spray, bear bangers or nothing. EVERYONE we spoke to in Jasper advised us to take something so in the end we left with two bear banger launchers and 6 cartridges. Over the next few days we saw one black bear minding his own business, and the bear bangers never saw the light of day. 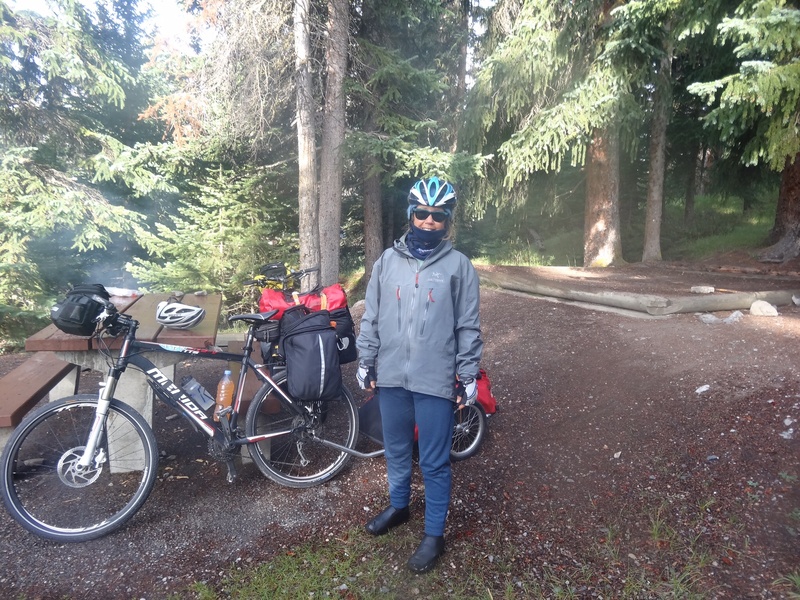 Our first destination on the Icefields Parkway was Honeymoon Lake, a provincial campground – open fires, long drops, no showers. These have been great and we’ve stayed in loads of them, generally costing around $25/night. It gets chilly in the Rockies. 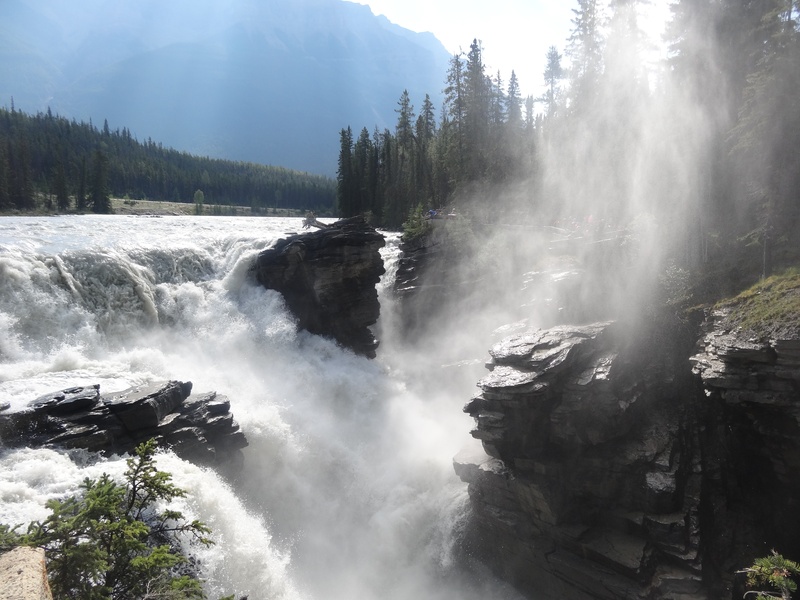 We stopped off at the thundering Athabasca Falls and spent a long while just watching as the swiftly flowing river falls into a rocky canyon, exploding into a fury of wild water. It’s both terrifying and mesmerising to watch. A plaque commemorates the life of a 21 year old man who ‘made a poor judgement’ on his last day. Nobody could survive the icy, raging torrent. The next day we had half a mind not to bother with to the Sunwapta Falls these since the Athabsca Falls were so outstanding. But it was well worth the effort, another violent churning of white water through a tight canyon. We continued on toward the first of the two high passes we would climb on this road. Just before the climb started, we pulled over to admire a glacier. A van advertising ‘mountain madness’ was parked nearby with doors flung wide and all kinds of delicious things on display – muffins, biscuits, trail mix, fruit, lollies etc – things we eat mountains of on the road. Excitedly I rode over to the van, thinking that someone had started an enterprising business but it turned out to be a tour operation run by an Australian guy, Ben. 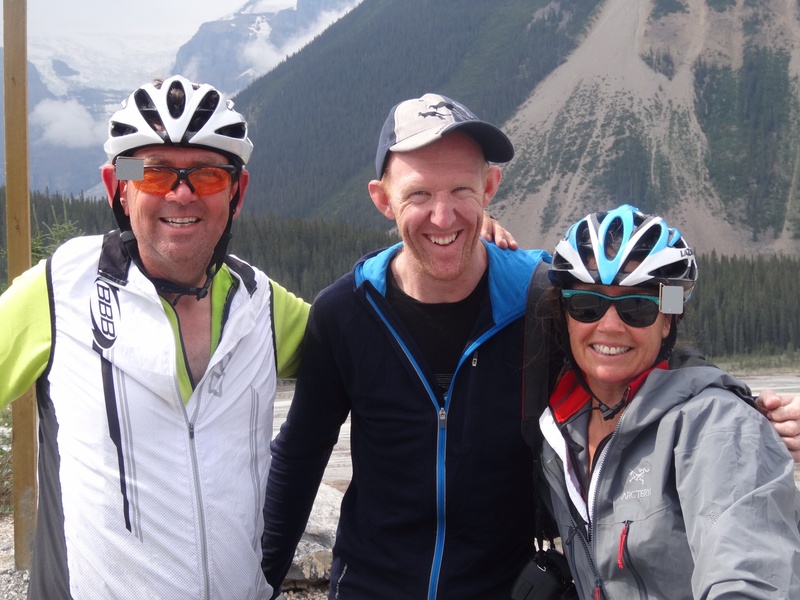 He brought people to the base of the climb, provided bikes and all gear, then fed, encouraged, supported and finally picked his clients up at the end of the day, returning them to their accommodation. He knows the look of a famished cyclist…’Help yourself to anything you want’, he said! Us with Ben who treated us to all sorts of yummy snacks before we took on the first pass. We couldn’t believe our ears and gratefully loaded up on a few goodies to help us along the way. It was a pretty tough climb with a sharp kick in the tail, but we made it. From here we continued on to the Icefields Centre, a truly awful place swarming with people and hideously expensive, dreadful food. Grieg quite suddenly couldn’t bear another moment and said we had to leave immediately. I wasn’t at all keen since it was raining outside and a thunderstorm was approaching. But it was just 3km to our campground so we made a dash for it, which turned out to be a good call. A campers kitchen with a roaring camp stove cheered us up. Several cyclists were already huddled around it drying off, warming up and recounting stories. Our day suddenly got really nice!. The mercury dropped and by morning it was just 2 degrees. I hit the road in 6 layers. Grieg got started with just three and gradually we both peeled off so by lunchtime in Saskatchewan Crossing we were sweating in singlets. The afternoon ride included a long climb, not so steep but I was making hard work of it. We stopped along the way to do a short hike. A half hour bush walk took us through lovely forest and on to the river. 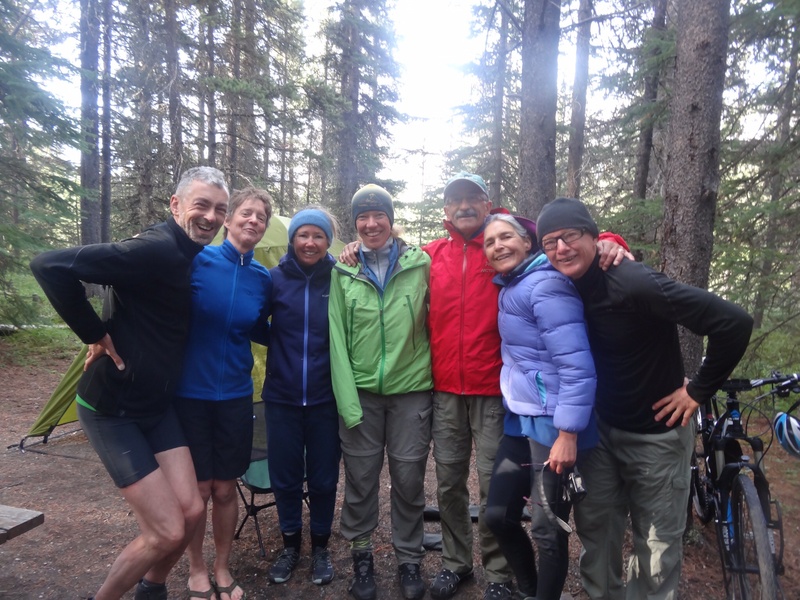 By the time we arrived at our campground, the beautiful glacial blue Waterfowl Lake, I was running at half speed and declining. More majestic mountains. All day, everyday we were surrounded by these giants, many with glaciers running down them. After setting up camp I crashed and woke later to find Grieg had cooked delicious food that I couldn’t touch. This was a bad thing since the next day we had our highest point to reach at 2080m. Our friends set up camp next door…let me introduce these lovely people. Sandra came over with some delicious ginger and lemon tea and lots of kindness. If kindness was the cure, I’d have been absolutely good to go. We wondered whether bears are interested in bowls of vomit. It turns out they aren’t and after a sleepless night we prepared for the big climb. Spectacular scenery surrounded us but the best I could do was ‘head down, keep peddling’ and somehow we made it through. There was another incentive, at Lake Louise we decided to stay in a hotel, have a hot shower, a real bed and soft white pillows. Two days here and all was well again. That evening Grieg copped a dose of illness too but it passed quickly thankfully. 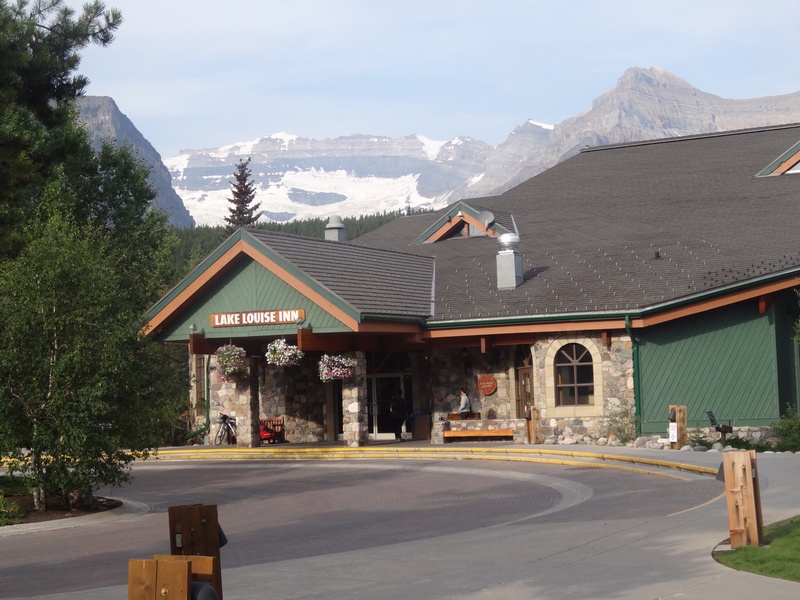 We ended up staying two nights and must be the only people to have visited Lake Louise for two perfect days and not managed to get to the lake. Maybe we’ll return someday for some hiking. But we did have a final catch up with these lovely people. At Saskatchewan Crossing we turned east, left the Rockies and headed for Edmonton. Our first night was spent in a dodgy little backwater called Nordegg where we travelled too many ‘incidental kms’ trying to find water with no success. Anyway we got the fire roaring, ate like kings and paid no camp fees since there wasn’t a soul, either camper or ranger to be seen. Next day was a pretty tiresome ride, long straight, undulating sameness to Rocky Mountain House which in itself is a nice little place. Farmers markets brought most the township out for the evening. 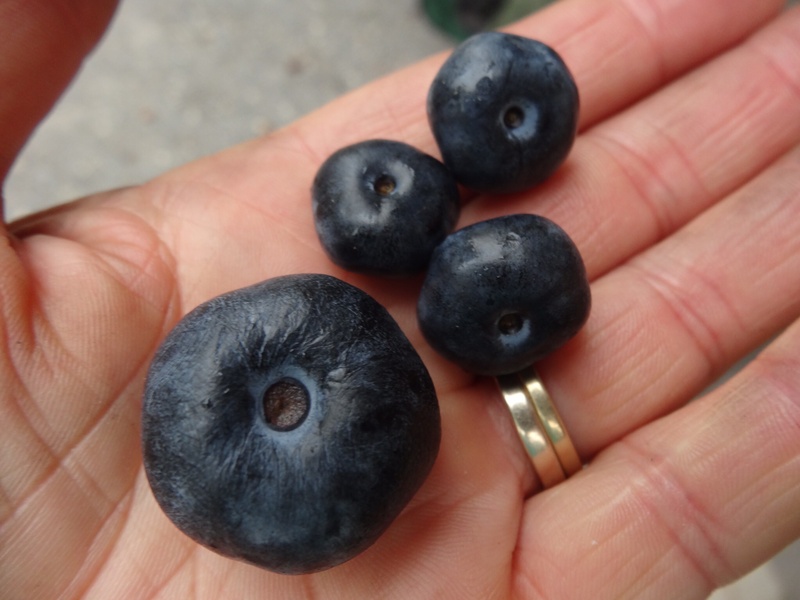 Hutterites – a lot like Amish, dressed in long skirts and headscarves were selling beautiful produce including giant sized blueberries. Next morning we hit the road for Red Deer. The word for the day? Boring. So this is now a recurring theme…if ever we harboured notions of riding across Alberta and Saskatchewan, these were completely dispelled on the road from Rocky Mountain House to Red Deer, 70km of straight, flat road stretched before us with canola and wheat as far as the eye could see, punctuated only by small oil drills. Red Deer is memorable for the unexpectedly outstanding coffee shop we came upon. I plugged the ipad in and settled back with blissful contentment and amazing coffee to catch up on emails and post the last blog. Meanwhile, Grieg had a haircut and found a bike shop for repair work on his bike. Huh? I can’t pull the thingy back! Assistance required getting to this stage! 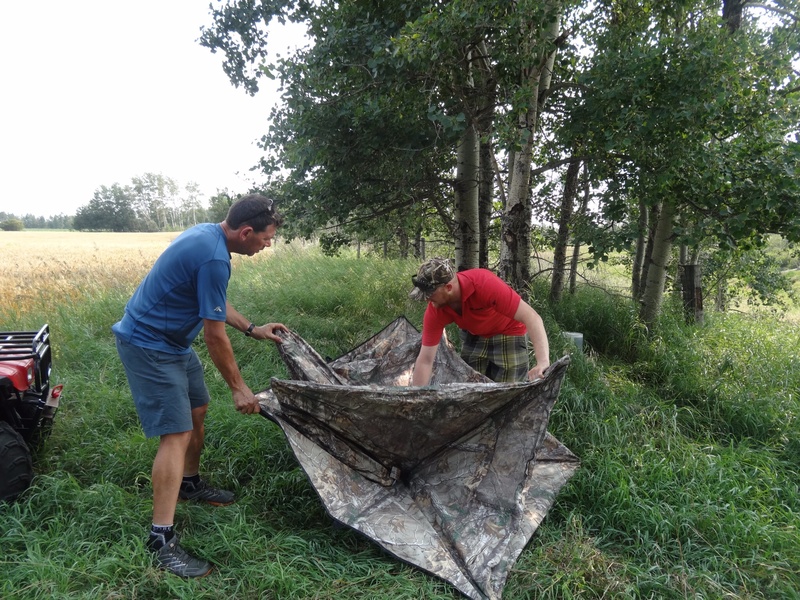 One afternoon we e helped Sean set up a blind. The scheming that goes into deer hunting is amusing. First a motion camera was set up for a couple of weeks to check where the best place for the blind would be. Now they’ll wait for a few more weeks while the deer get used to the blind. Then Sean will sit in there for hours on end, happily and patiently waiting for a deer to come by! We also tore around on ATV’s (fun when you’re on one), played table tennis (Sean won), watched a Royal Canadian Mounted Police display and some crazy pony races (hilarious), shared dinner with Sean’s family (great fun hosts), picked berries (Grieg was great at this, I ate most of mine before they reached the container), visited bison (massive fluffy fellows), went to the gigantic Edmonton Mall (not for long), drove around in Sean’s truck and hardly touched the bikes. Sean and Alison took us to the airport, bringing this chapter of our travels to a close, and beginning a whole new one. Hey Rhonda, yeah we loved Alberta apart from riding on the plains. So glad we did it but two days was enough. Heading north for Quebec now and the trees are starting to turn, love it, so beautiful. See you in a month!